This last week has been pretty stressful. On Wednesday my car decided to start acting wonky. It has been losing power on acceleration. I figured it was the spark plugs, so I bought some new ones and changed them out. Two days later (yes, it took that long, and my hands are cut up too) my car has new spark plugs and wires, and it’s still acting up. It’s Mother’s Day weekend, so we decide to take my car to Ardmore so that I can put some fuel injector cleaner in the gas and see if that helps out. So, we get to Ardmore, and Donna’s parents buy us lunch at McDonald’s (McYucky’s as we call it). Then they want to go to the park with the kids. I didn’t really want to since my car is acting up, but Donna doesn’t give me any choice. While at the park, Donna’s mom thinks it will be a good idea to take the kids to the splashpad so they can play in the water. I tried to sit that one out, but Donna made me go sit with everyone else. Russell, his usual self, falls down while running and hits his head on the concrete. It was bad enough that everyone makes us take him to the emergency room. It was pretty scary, because he was drooling and sedated. After the doctor sees us, Russell even throws up a couple of times. They do a CT scan and let us know he’ll be okay, after which Russell finally starts coming to (about two hours after his accident!). After all that, we go to El Chico to eat, where Russell wolfs down chips and queso. He had been begging for nachos as soon as we left the hospital. After barfing it all up though, he seems fairly content not to eat any more. Sunday, Mother’s Day, was mostly uneventful. I grilled (burned) hamburger, hotdogs, bratwurst, and shrimp, and we feasted. Then we packed up and went home. We’ve had the new house for just about two months now. It’s amazing how quickly I’ve gotten used to living here! It definitely feels like home now. I think the kids have gotten used to it now too; they sure have been making messes! So I guess things are starting to get back to normal. We’ve had Russell in at the doctor a couple of times. Once to the urologist in Fort Worth, and once to the speech therapist. We go back to the urologist tomorrow. Boy, kids are expensive! We’re just now getting started paying on the medical bills from Todd Daniel’s birth, and now we’re going to start getting some more for Russell! We had lots of help moving most of the stuff from Wichita to Holliday yesterday. We now live in Holliday. There’s still a lot of clutter around the old house that we need to take care of, and then we can clean it up and be done with it. Fun times! This buying-a-house business has gone surprisingly smooth so far <knock on wood!>. We are supposed to close today at 2:30pm! I am thrilled, excited, nervous, and whatever else you can think of. Donna, on the other hand, is sick. “Coming out both ends,” as she says. She said that we’re going to close today even if the notary has to follow her into the bathroom! I’ve already begun making house in Holliday. I’ve had the utilities transferred to my name. We just have to let them know when we get there so they can turn the water on for us. We wouldn’t want a flooded laundry room after all! My plan is to purchase a refrigerator tonight or tomorrow, to be delivered in the next couple of days. We will work on cleaning in the new house and packing up the old house. I hope to get officially moved in by the end of next weekend… We’ll see how that goes! The inspection went well and the appraisal came back. It is good. Now we’re just waiting to see if we’ll be approved for the loan. Every once in a while my loan officer emails me to ask for more information, so I know everything is still moving, but it sure seems to have slowed down! From around the curve they hear screeching tires and a big splash. Today is Todd Daniel’s birthday! He was born at 1:18pm at United Regional Hospital in Wichita Falls. 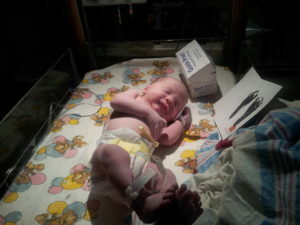 He weighed in at 6lb 9oz and was 19.5 inches long. He was really similar to Russell’s size. 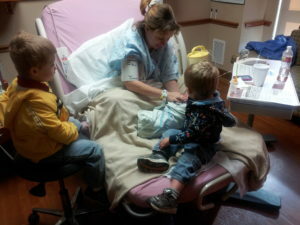 Preston and Russell had a good time visiting him in the hospital, and they seemed to be thrilled to get to meet him! Donna was a trooper, and is doing great now. It won’t be long at all now before Todd Daniel is born. It is looking like it will be no later than the 12th. I am really excited, but a little nervous too. Donna and I have been working with the kids on keeping their room (and all the others they destroy!) clean. I think we’re about as ready as we’re going to be!